On a soggy Friday morning beneath the historic Twin Spires, nine Breeders’ Cup contenders completed their major preparation for the World Championships on Nov. 2-3 at Churchill Downs. MIND YOUR BISCUITS TUNES UP FOR THE CLASSIC – Trainer Chad Summers’ top Breeders’ Cup Classic (GI) contender Mind Your Biscuits completed what appeared to be his final major preparation for the $6 million test with an easy five-furlong move in 1:03.20 early Friday morning at Churchill Downs. SEEKING THE SOUL WORKS HALF-MILE IN :47.60, STEWART HOPES TO SNEAK INTO CLASSIC – Currently on the outside of the Breeders’ Cup Classic (GI) field looking in is locally based trainer Dallas Stewart’s Ack Ack (GIII) winner Seeking the Soul who worked a half-mile in :47.60 Friday morning at Churchill Downs. DUBAI WORLD CUP WINNER THUNDER SNOW (IRE) BREEZES SEVEN FURLONGS IN 1:27 – Godolphin’s Dubai World Cup (GI) winner Thunder Snow (IRE) completed his final step prior to the Breeders’ Cup Classic (GI) with a seven-furlong move in 1:27 at 5:30 a.m. EDT Friday at Churchill Downs. WHITMORE BLITZES HALF-MILE IN :46.20 FOR TWINSPIRES BREEDERS’ CUP SPRINT – Trainer Ron Moquett’s crack sprinter Whitmore was the first horse onto the Churchill Downs racetrack Friday at 5:20 a.m. EDT and breezed a :46.20 half-mile inside of stablemate Meanbone in preparation for the TwinSpires Breeders’ Cup Sprint (GI). Whitmore worked inside of Meanbone through splits of :11.40, :22.20 and :34, before galloping out five furlongs in 1:00.20, according to Nichols. It was the fastest work of 26 horses at the distance. The 5-year-old chestnut gelding by Pleasantly Perfect was most recently the runner-up in the Phoenix Stakes (GII) at Keeneland behind Promises Fulfilled. MR. MONEY FIRES BULLET FOR BREEDERS’ CUP JUVENILE – Allied Racing Stable’s Mr. Money signaled his readiness for next Friday’s $2 million Sentient Jet Breeders’ Cup Juvenile (GI) by working five furlongs in :59.60 over a track labeled as good early Friday morning. With jockey Gabriel Saez aboard, Mr. Money produced fractions of :12.60, :36.20 and :59.60 for the fastest of 36 works at the distance. Mr. Money galloped out six furlongs in 1:12 and seven furlongs in 1:25.60, according to Nichols. “He went a little faster than I wanted him to, but the track is a little quick,” trainer Bret Calhoun said of the work that was accomplished at 6 o’clock, well before a soaking rain turned the track to “sloppy” later in the morning. Mr. Money broke his maiden on his third try, winning a 1 1/16-mile race here Sept. 28. “He won going two turns here and I think that is an advantage,” Calhoun said. Calhoun also said that Carl R. Moore Management’s Finley’sluckycharm came out of her half-mile work of :47.80 on Thursday fine. Finley’sluckycharm, a winner of 6-of-7 starts at Churchill Downs, is pre-entered in the $1 million Breeders’ Cup Filly & Mare Sprint (GI). FOUR BREEDERS’ CUP CONTENDERS LOG TURF WORKS FRIDAY AT CHURCHILL DOWNS – With light rain falling at 9:45 a.m. Friday at Churchill Downs, Breeders’ Cup contenders Chelsea Cloisters, Forty Under, Pakhet and Shang Shang Shang recorded works over the “yielding” Matt Winn Turf Course. Trainer Wesley Ward’s Breeders’ Cup Juvenile Sprint hopefuls Chelsea Cloisters and Shang Shang Shang breezed a half-mile, in company, in :50.80 and :51.40, respectively. Indian Summer Stakes runner-up Chelsea Cloisters, who is No. 13 on the preference list for the Juvenile Turf Sprint that is limited to 12 starters, began her breeze one length behind Shang Shang Shang and finished two lengths in front at the wire through splits of :13.80 and :26.80, according to Nichols. Veteran rider Aaron Gryder was aboard Florida-bred Shang Shang Shang who is undefeated in two career starts including a victory at Royal Ascot in the Norfolk Stakes (GII). Eclipse Thoroughbred Partners’ Pakhet, runner-up in the Jessamine (GII) at Keeneland in her most recent start, worked a half-mile on the yielding turf course in :51.40 with exercise rider Juan Bernardini up, in preparation for the $1 million Juvenile Fillies Turf (GI). Fractions on the work were :14, :27, :51.40 and out five-eighths in 1:06, according to Nichols. The remainder of Pletcher’s eight-horse Breeders’ Cup contingent is scheduled to arrive Monday. Working just ahead of Pakhet was August Dawn Farm’s Forty Under, winner of the Pilgrim (GIII) at Belmont in his most recent start for trainer Jeremiah Englehart. With exercise rider Marquel Lemon aboard, Forty Under worked a half-mile in :52.20 with splits of :14.20, :28.20, :52.20 and out five-eighths in 1:05.60, according to Nichols. Now 2-for-2 on the grass, Forty Under will be ridden in the $1 million Breeders’ Cup Juvenile Turf (GI) by Manny Franco. Director of the Stable Area Steve Hargrave. All 22 contenders must quarantine for a minimum 42 hours and could possibly train on Monday. … The following horses are expected to breeze Saturday morning at Churchill Downs: Axelrod (Classic, Barn 43); City of Light (Dirt Mile/Classic, Barn 43); Golden Mischief (Filly & Mare Sprint, Barn 23); Monomoy Girl (Distaff, Barn 23); Promises Fulfilled (Sprint, Barn 4); Reflect (Juvenile Fillies, Barn 26); Trophy Chaser (Juvenile, Barn 34); Seven Trumpets (Dirt Mile, Barn 4); and Vibrance (Juvenile Fillies, Barn 43). 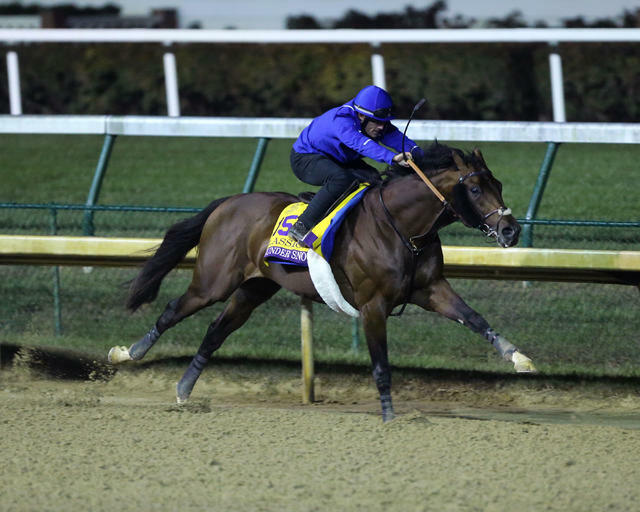 BARN LIST – All Breeders’ Cup contenders must be on the grounds 72 hours prior to their race. Many of the contenders will arrive over the weekend. Check for updates regarding arrivals via Twitter from @DerbyMedia.